KASHGAR, China — This is a city where growing a beard can get you reported to the police. So can inviting too many people to your wedding, or naming your child Muhammad or Medina. Driving or taking a bus to a neighboring town, you’d hit checkpoints where armed police officers might search your phone for banned apps like Facebook or Twitter, and scroll through your text messages to see if you had used any religious language. You would be particularly worried about making phone calls to friends and family abroad. Hours later, you might find police officers knocking at your door and asking questions that make you suspect they were listening in the whole time. Over the past two months, I interviewed more than two dozen Uighurs, including recent exiles and those who are still in Xinjiang, about what it’s like to live there. The majority declined to be named because they were afraid that police would detain or arrest their families if their names appeared in the press. Taken along with government and corporate records, their accounts paint a picture of a regime that at once recalls the paranoia of the Mao era and is also thoroughly modern, marrying heavy-handed human policing of any behavior outside the norm with high-tech tools like iris recognition and apps that eavesdrop on cell phones. China’s government says the security measures are necessary in Xinjiang because of the threat of extremist violence by Uighur militants — the region has seen periodic bouts of unrest, from riots in 2009 that left almost 200 dead to a series of deadly knife and bomb attacks in 2013 and 2014. The government also says it’s made life for Uighurs better, pointing to the money it’s poured into economic development in the region, as well as programs making it easier for Uighurs to attend university and obtain government jobs. Public security and propaganda authorities in Xinjiang did not respond to requests for comment. China’s Foreign Ministry said it had no knowledge of surveillance measures put in place by the local government. But analysts and rights groups say the heavy-handed restrictions punish all of the region’s 9 million Uighurs — who make up a bit under half of the region’s total population — for the actions of a handful of people. The curbs themselves fuel resentment and breed extremism, they say. The ubiquity of government surveillance in Xinjiang affects the most prosaic aspects of daily life, those interviewed for this story said. D., a stylish young Uighur woman in Turkey, said that even keeping in touch with her grandmother, who lives in a small Xinjiang village, had become impossible. Whenever D. called her grandmother, police would barge in hours later, demanding the elderly woman phone D. back while they were in the room. “For god’s sake, I’m not going to talk to my 85-year-old grandmother about how to destroy China!” D. said, exasperated, sitting across the table from me in a café around the corner from her office. After she got engaged, D. invited her extended family, who live in Xinjiang, to her wedding. Because it is now nearly impossible for Uighurs to obtain passports, D. ended up postponing the ceremony for months in hopes the situation would improve. D. felt her heart sink, but she just nodded and kept talking. As soon as the call ended, she said, she burst into tears. 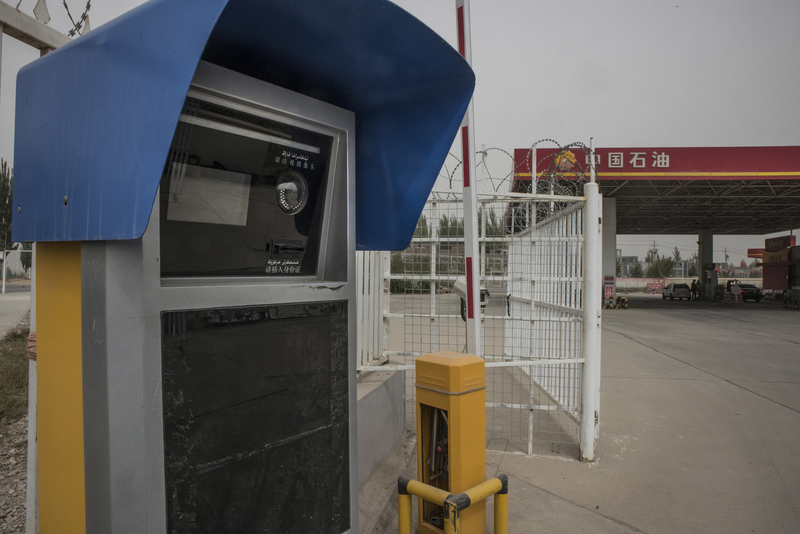 China’s government has invested billions of renminbi into top-of-the-line surveillance technology for Xinjiang, from facial recognition cameras at petrol stations to surveillance drones that patrol the border. Experts believe this surveillance video, which shows a Chinese street intersection, uses artificial intelligence and deep-learning for face, body, and behavioral recognition. However, BuzzFeed News couldn’t independently verify that the video was created by SenseTime Group as shown in the video. China is not alone in this — governments from the United States to Britain have poured funds into security technology and know-how to combat threats from terrorists. But in China, where Communist Party–controlled courts convict 99.9% of the accused and arbitrary detention is a common practice, digital and physical spying on Xinjiang’s populace has resulted in disastrous consequences for Uighurs and other ethnic minorities. Many have been jailed after they advocated for more rights or extolled Uighur culture and history, including the prominent scholar Ilham Tohti. China has gradually increased restrictions in Xinjiang for the past decade in response to unrest and violent attacks, but the surveillance has been drastically stepped up since the appointment of a new party boss to the region in August 2016. Chen Quanguo, the party secretary, brought “grid-style social management” to Xinjiang, placing police and paramilitary troops every few hundred feet and establishing thousands of “convenience police stations.” The use of political education centers — where thousands have been detained this year without charge — also radically increased after his tenure began. Spending on domestic security in Xinjiang rose 45% in the first half of this year, compared to the same period a year earlier, according to an analysis of Chinese budget figures by researcher Adrian Zenz of the European School of Culture and Theology in Germany. A portion of that money has been poured into dispatching tens of thousands of police officers to patrol the streets. In an August speech, Meng Jianzhu, China’s top domestic security official, called for the use of a DNA database and “big data” in keeping Xinjiang secure. It’s a corner of the country that has become a window into the possible dystopian future of surveillance technology, wielded by states like China that have both the capital and the political will to monitor — and repress — minority groups. The situation in Xinjiang could be a harbinger for draconian surveillance measures rolled out in the rest of the country, analysts say. A blacksmith works under watch of a police guard in Kashgar. The compound is called the Kashgar Professional Skills Education and Training Center, according to a sign posted outside its gates. When I took a cell phone photo of the sign in September, a police officer ran out of the small station by the gate and demanded I delete it. “What kind of things do they teach in there?” I asked. “I’m not clear on that. Just delete your photo,” he replied. Before this year, the compound was a school. But according to three people with friends and relatives held there, it is now a political education center — one of hundreds of new facilities where Uighurs are held, frequently for months at a time, to study the Chinese language, Chinese laws on Islam and political activity, and all the ways the Chinese government is good to its people. He hadn’t heard from them since, he said, and even their families cannot reach them. Since this spring, thousands of Uighurs and other minorities have been detained in compounds like this one. Though the centers aren't new, their purpose has been significantly expanded in Xinjiang over the last few months. Through the gaps in the gates, I could see a yard decorated with a white statue in the Soviet-era socialist realist style, a red banner bearing a slogan, and another small police station. The beige building inside had shades over each of its windows. A propaganda poster on the walls of a political education compound in Kashgar reads, “Cherish ethnic unity as you cherish your own eyes." Detention for political education of this kind is not considered a form of criminal punishment in China, so no formal charges or sentences are given to people sent there, or to their families. So it’s hard to say exactly what transgressions prompt authorities to send people to the centers. Anecdotal reports suggest that having a relative who has been convicted of a crime, having the wrong content on your cell phone, and appearing too religious could all be causes. It’s clear, though, that having traveled abroad to a Muslim country, or having a relative who has traveled abroad, puts people at risk of detention. And the ubiquity of digital surveillance makes it nearly impossible to contact relatives abroad, according to the Uighurs I interviewed. One recent exile reported that his wife, who remained in Xinjiang with their young daughter, asked for a divorce so that police would stop questioning her about his activities. R., a Uighur student just out of undergrad, discovered he had a knack for Russian language in college. He was dying to study abroad. Because of the new rules imposed last year that made it nearly impossible for Uighurs to obtain passports, the family scraped together about 10,000 RMB ($1500) to bribe an official and get one, R. said. R. made it to a city in Turkey, where he started learning Turkish and immersed himself in the culture, which has many similarities to Uighur customs and traditions. But he missed his family and the cotton farm they run in southern Xinjiang. Still, he tried to avoid calling home too much so he wouldn’t cause them trouble. "She would never talk like that. It felt like a police officer was standing next to her." “In the countryside, if you get even one call from abroad, they will know. It’s obvious,” said R., who agreed to meet me in the back of a trusted restaurant only after all the other patrons had gone home for the night. He was so nervous as he spoke that he couldn’t touch the lamb-stuffed pastries on his plate. In March, R. told me, he found out that his mother had disappeared into a political education center. His father was running the farm alone, and no one in the family could reach her. R. felt desperate. Two months later, he finally heard from his mother. In a clipped phone call, she told him how grateful she was to the Chinese Communist Party, and how good she felt about the government. Since that call, his parents’ phones have been turned off. He hasn’t heard from them since May. A Uighur man stares at a police station from a balcony in Kashgar. Security has become a big business opportunity for hundreds of companies, mostly Chinese, seeking to profit from the demand for surveillance equipment in Xinjiang. Researchers have found that China is pouring money into its budget for surveillance. Zenz, who has closely watched Xinjiang’s government spending on security personnel and systems, said its investment in information technology transfer, computer services, and software will quintuple this year from 2013. The growth in the security industry there reflects the state-backed surveillance boom, he said. He noted that a budget line item for creating a “shared information platform” appeared for the first time this year. The government has also hired tens of thousands more security personnel. Armed police, paramilitary forces, and volunteer brigades stand on every street in Kashgar, stopping pedestrians at random to check their identifications, and sometimes their cell phones, for banned apps like WhatsApp as well as VPNs and messages with religious or political content. Other equipment, like high-resolution cameras and facial recognition technology, is ubiquitous. In some parts of the region, Uighurs have been made to download an app to their phones that monitors their messages. Called Jingwang, or “web cleansing,” the app works to monitor “illegal religious” content and “harmful information,” according to news reports. A tweet shows officials in Xinjiang checking phones for the installation of an app that monitors the content of their phones. 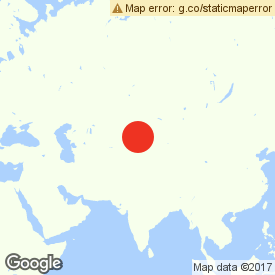 The internet is painfully slow in the region. Maya Wang, a China researcher for Human Rights Watch, has also documented the use of a DNA database targeting Uighurs as well as political dissidents and migrants, along with the use of voice pattern recognition. When I walked into a checkpoint a few miles east of Kashgar, a police officer stood near the entrance to check commuters’ cell phones for banned apps and messages (as a foreigner I was sent to a separate line and not asked for my phone). Their faces were then scanned by a facial recognition camera and matched with their identification cards. Glossy white machines for full-body scans stood on the other side of the room. Petrol stations have a similar setup. At a station I visited in Kashgar in September, visitors were stepping out of their cars to have their faces scanned and matched with identity cards before filling up. As a foreigner, I was only asked for my passport. “Because Xinjiang is not stable, we have been able to sell a lot to the government authorities there,” said the owner of a small Beijing-based company that manufactures surveillance drones and other security equipment for Chinese law enforcement agencies. Xinjiang, he said, uses the drones near its western borders. The government relies on contracting with companies like Beijing Wanlihong Technology Company, which produces an iris-recognition system that it says is more accurate than facial and fingerprint scanning techniques. Wanlihong is involved in a pilot project in Kashgar that includes providing equipment and training. “The goal of the system is to build a powerful and extensive identity verification system to identify key suspects and initiate an emergency response mechanism in a timely way,” the company says on its website. The data could be collected and used to monitor the physical movements of suspicious people on roads, it adds, or combined with their SMS and browsing data obtained from cellular carriers. 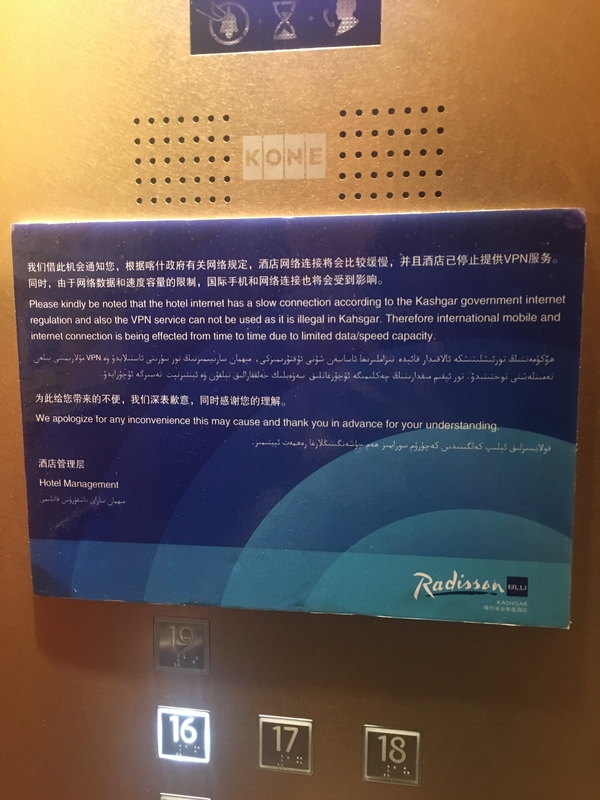 Left: A note in a hotel elevator in Kashgar alerts visitors to slow internet speed. Right: A camera for face recognition at the entrance of a gas station. Urumqi-based Leon Technology — a company that integrates artificial intelligence into its security services and then provides those services to telecommunications companies and government agencies in Xinjiang and elsewhere in China — saw its earnings grow by 260% in the first quarter of 2017. “The Xinjiang government is bound to spend large sums of money to safeguard people’s property and the safety of their lives, protecting the region’s peace, development and stability,” it said in an article posted on its website. James Leibold, an associate professor at La Trobe University in Australia who is conducting research on security contractors in Xinjiang, said the broader security industry, including both physical policing and surveillance, is now the biggest employer of people in the region. “Marketers in Shanghai are calling it the golden era of investment in security in Xinjiang,” he said. Leibold noted that despite the high-tech equipment, it’s still unclear how effective the government is at actually analyzing the large volumes of video and audio recordings. But it’s clear the state is now pouring resources into doing just that — marrying information gleaned from phone tapping, security cameras, and other sources in an effort to create detailed profiles of people. “This is entirely top-down control,” he added. State-owned companies are using Xinjiang as a testing ground for big data, Zenz said, and Xinjiang has historically been used to test out surveillance technology that is later rolled out in other parts of the country. Many companies have set up R&D labs in the region for this purpose with government backing. Surveillance in Xinjiang may be particularly harsh, but it’s clear the government is expanding the use of the technology in the rest of the country, too. Outside Xinjiang, facial recognition is already being used increasingly by Chinese law enforcement to catch criminals, according to media reports. At a beer festival in the seaside city of Qingdao in August, 49 people found themselves arrested when cameras matched their faces with a national police database that showed they were suspected of crimes like theft and drug use. In another big data foray, the government is also working on a “social credit system,” which would put together lots of variables, including patriotism and moral behavior, to assign numerical scores to its citizens. But beyond digital surveillance, many said the government has simply flooded the region with personnel dedicated to tracking residents’ every move. T., a writer, lived in an apartment complex in the regional capital of Urumqi with his wife and daughters until the middle of this summer. (He and his family are now in the US. He asked me not to disclose which city because he was afraid of being identified by the government.) For years, an official representing the neighborhood’s Communist Party committee would visit his home every week and ask a set of questions that soon became mundane: Who had come to visit? Was anyone pregnant? Had anyone changed jobs? She would then report the information to the local police department, he said. Then in April, the questions changed. The official began to ask whether the family was Muslim, and how they practiced. T. had never been very religious. But he says he respected Islam because it’s a big part of Uighur culture. The family kept a small collection of religious texts on their bookshelves, as well as four prayer rugs. But the questions made him nervous. He told the official he was not a believer. A month later, the disappearances started. Friends would vanish in the middle of the night, spirited away by police to political education centers. His neighbors began to disappear, he said, one after the other. T. was terrified. Every evening he placed an overcoat and a pair of thick winter trousers near the door so he could pull them on quickly if the police came for him — the weather was warm but he was afraid he could be held into the winter months. He gave away the prayer rugs, and in the relative safety of the apartment, he burned every religious book. The first people in T.’s apartment building to disappear, he said, were those who had traveled abroad and returned, particularly to Muslim countries, from Malaysia to Egypt. Then, in June, he says the police began to conduct random checks of pedestrians’ mobile phones at street corners, bus stops, and petrol stations, sometimes downloading their contents to handheld devices. The police would dispense warnings to anyone whose phone carried banned apps like WhatsApp and Facebook. Sometimes, he said, police would come to some people’s homes and businesses to check their computers for banned software and content. Abduweli Ayup fled to Turkey in 2015 after repeated detentions in Xinjiang. After 15 months in prison, Abduweli returned home to his wife and two young daughters, and he was hoping things could go back to normal. But one July day in 2015, trouble found him again as he was commuting to work at a checkpoint he must have been through a thousand times. The officers who usually waved him through had been replaced by Special Weapons and Tactics police. When they saw his ID papers, they noticed his prison history. That’s when they demanded his laptop. “I said, ‘They know me here. I come here every day,’” Abduweli said. In response, one of the officers slapped him across the face, he said. When the police opened his laptop, they found essays he had written, years before, during an academic fellowship in Kansas. In his writing, he expressed his views on taboo subjects from Uighur culture to dictatorships as a system of government. Abduweli was detained immediately, strip searched, and interrogated for hours about his writing by a group of six officers, he said. One of the officers told him if he was caught with essays like that on his laptop again, he would be sent back to prison. The government has said repeatedly that its goal in Xinjiang is to achieve both ethnic unity and social stability. Beyond curbs on the Uighur population, it has also provided subsidies for some Uighur workers and affirmative action programs for students to attend top universities, and takes pains to recruit them into government jobs. A significant percentage of the police in Kashgar, for instance, are themselves Uighur. China also points to its growing investment in the infrastructure and key industries in historically underdeveloped Xinjiang, including roads, construction, and telecommunications networks. But critics say those efforts are overshadowed by the government’s more repressive measures, which have fueled the propaganda of a small number of extremists, including the Turkestan Islamic Party (TIP), a radical Uighur militant group, some of whose adherents are believed to have been active in Syria and Afghanistan. According to a translation by the Middle East Media Research Institute, TIP released an issue of its online magazine on Aug. 29, calling for its fighters in Syria to prepare for future battle against the Chinese state in East Turkestan, a name many Uighurs use to refer to Xinjiang. The issue sought to draw attention to the situation in Xinjiang and the treatment of Muslims by the Chinese government. "I can see it in the younger generation," said D., the woman who postponed her wedding because her relatives in Xinjiang couldn't obtain passports in order to attend. "They are more angry." These days, Abduweli is trying to finish a children’s book explaining Uighur language and culture to elementary school kids. The pages are illustrated with clip art of generic cartoon children, culled from a Google image search. What the book really needs is a Uighur illustrator who understands the culture, Abduweli said, but because of his status as a former political prisoner, all the really good artists are too afraid to be publicly associated with him. In December, the Chinese government abruptly canceled Abduweli’s passport, rendering him stateless. He’s applying for refugee status through the UN in Ankara. Sometimes, he thinks back to his college years in Beijing in the early 1990s, which he remembers as his first real taste of freedom. Abduweli remembers vividly a Chinese-language book he picked up from a street vendor. He loved it so much he biked across the city to a foreign-language bookshop to find the original English version, which he scoured page by page. He felt sure there were parts that the Chinese censors had removed. The book was George Orwell’s 1984, and it reminded him, he said, of home. A Uighur family walks past a surveillance camera in Kashgar.